Objectives The objective of this study was to compare the temporal trends in survival after out-of-hospital cardiac arrest (OHCA) between two large metropolitan communities in Asia and evaluate the factors affecting survival after OHCA. Design A population-based prospective observational study. Setting The Cardiovascular Disease Surveillance (CAVAS) project in Seoul and the Utstein Osaka Project in Osaka. Participants A total of 36 292 resuscitation-attempted OHCAs with cardiac aetiology from 2006 to 2011 in Seoul and Osaka (11 082 in Seoul and 25 210 in Osaka). Primary outcome measures The primary outcome was neurologically favourable survival. Trend analysis and multivariable Poisson regression models were conducted to evaluate the temporal trends in survival of two communities. Results During the study period, the overall neurologically favourable survival was 2.6% in Seoul and 4.6% in Osaka (p<0.01). In both communities, bystander cardiopulmonary resuscitation (CPR) rates increased significantly from 2006 to 2011 (from 0.1% to 13.1% in Seoul and from 33.3% to 41.7% in Osaka). OHCAs that occurred in public places increased in Seoul (12.5% to 20.1%, p for trend <0.01) and decreased in Osaka (13.5% to 10.5%, p for trend <0.01). The proportion of OHCAs defibrillated by emergency medical service (EMS) providers was only 0.4% in 2006 but increased to 17.5% in 2011 in Seoul, whereas the proportion in Osaka decreased from 17.7% to 13.7% (both p for trend <0.01). Age-adjusted and gender-adjusted rates of neurologically favourable survival increased significantly in Seoul from 1.4% in 2006 to 4.3% in 2011 (adjusted rate ratio per year, 1.17; p for trend <0.01), whereas no significant improvement was observed in Osaka (3.6% in 2006 and 5.1% in 2011; adjusted rate ratio per year, 1.03; p for trend=0.08). Conclusions Survivals after OHCA were increased in Seoul while remained constant in Osaka, which may have been affected by the differences and improvements of patient, community, and EMS system factors. This study demonstrated the differences in survival outcomes between two Asian communities. We used data from two large population-based registries of out-of-hospital cardiac arrest (OHCA). Neurological and survival outcomes in Seoul increased significantly over the study period. Neurological and survival outcomes in Osaka changed steadily over the study period. The limitation is that iInformation on hospital-based postresuscitation care of OHCA that might affect outcomes was not available. The temporal trends of survival outcomes after OHCA show variations across different communities.2 ,5–9 Some nationwide population-based studies have successfully demonstrated significant improvements in the chain of survival and outcomes, while others have shown no improvements over the past 20 years.5 ,6 ,10 A better understanding of temporal trends in survival outcomes and chain of survival may corroborate evidence-based interventions towards reducing the health burden of OHCA. The purpose of this study was to compare the temporal trends in survival outcome, chain of survival and patient factors for OHCAs between two large metropolitan communities in Asia, and to evaluate important factors that affect survival after OHCA, using population-based registries according to the international research guidelines for OHCA. The total population was 9.6 million in Seoul (2010) and 8.8 million in Osaka (2010). The population structures and EMS characteristics of the two communities are shown in table 1. In both communities, the EMS level is intermediate where the highest qualified emergency medical technicians can give CPR with AED, perform advanced airway management and inject intravenous fluid or drug. Under each country's guideline, EMS providers are required to continue CPR unless there is a return of spontaneous circulation on the scene. In Seoul, EMS providers are encouraged to scoop and run to the emergency department (ED) while giving CPR during ambulance transport as soon as possible after giving one cycle of CPR. In Osaka, EMS providers are usually encouraged to stay for around 10 min for interventions including 3–4 cycles of CPR.17 EMS providers can withdraw provision of CPR with online medical control when there is evident death, such as rigor mortis, postmortem lividity, incineration, decomposition or decapitation, as well as patients with ‘Do Not Resuscitate’ orders. All patients with OHCA who were assessed by EMS providers were transported to an ED. An EMS system quality control programme was initiated in 1998 in Osaka through the Utstein Osaka Project, while the quality control programme in Seoul was established in 2011.9 ,19 ,20 Numbers of ambulances per square kilometre were 0.19 (2010) and 0.15 (2009) in Seoul and Osaka, respectively (table 1). Data were collected from the EMS run sheet in Osaka, and from the EMS run sheet and hospital medical record review in Seoul. The following Utstein factors were collected: age, gender, aetiology of arrest, place of occurrence, witness, CPR and defibrillation by bystanders, prehospital initial ECG, CPR and defibrillation by EMS providers and survival outcomes. In both communities, the same definitions were used according to the Utstein data report form21 in which the details of each data set were described in previous reports.5 ,9 ,10 ,19 ,20 ,22 The elapsed time intervals, such as from call to wheel arrival at scene, from scene to departure to ED, from call to arrival at ED, and from call to first CPR, were standardised and measured in both communities. Also, time intervals from call to first defibrillation of patients with an initial shockable ECG were measured in both communities. The time intervals from call to first CPR and from call to first defibrillation were available only in 2011 in Seoul. The primary outcome was neurologically favourable survival after OHCA with cerebral performance category 1 or 2. The secondary outcome was survival to discharge (Seoul) and 1 month survival (Osaka). In Seoul, outcomes were collected by a hospital medical record review performed after discharge. The medical record review was performed by medical record experts employed at the Korea Center for Disease Controls and Prevention. In Osaka, outcomes were collected by EMS providers from hospital via a telephone interview or fax report. Demographic characteristics of all eligible cases in the two communities were first explored. Continuous and categorical variables were compared using the Wilcoxon rank sum test and χ2 test, respectively. To evaluate the changes in baseline characteristics, p for trend was calculated by the Cochran-Armitage test. Age-standardised and gender-standardised OHCA and survivor incidence rates per 100 000 person-years for the study population were calculated to compare trends by years and communities. The sum of the 2010 Census data of Seoul and Osaka by age (decade) and gender was used as the standard population (direct standardisation method). To assess whether survival outcomes had improved over time in the two communities, multivariable Poisson regression models were constructed. The Poisson distribution was used to directly estimate rate ratios (RR) instead of ORs to avoid its potential exaggeration.23 ,24 RRs for survival outcomes and 95% CIs were calculated after adjusting for age and gender. After calculation of adjusted RR for each calendar year (from 2007 to 2011), we used the year 2006 as the reference year and multiplied the adjusted RR for each year by the observed survival rate for the reference year to obtain yearly risk-adjusted survival rates for the study period.24 These rates represent the estimated survival for each year if the patient case mix were identical to that in the reference year.24 We also evaluated calendar year as a continuous variable to obtain adjusted RRs for year-to-year survival trends. We also examined the effects of interaction between the calendar year and other potential risk factors on the main outcome by communities using the chunk test, followed by a backward elimination process for the full model, which included main exposure, potential risk factors and all interaction products. Since there was no statistically significant interaction product, we simply used the main exposure variable and potential risks for the final model. During the study period, there were 18 813 and 42 340 EMS-assessed OHCAs in Seoul and Osaka, respectively, in which 11 082 (58.9%) in Seoul and 25 210 (59.5%) in Osaka were selected for analysis as resuscitation-attempted OHCAs with cardiac aetiology (figure 1). The characteristics of the patients, community and EMS factors based on the Utstein criteria are shown in table 2. Study flow of out-of-hospital cardiac arrest (OHCA) patients from 1 January 2006 to 31 December 2011. The temporal trends in chain of survival (resuscitation time course) and patient factors affecting outcomes after cardiac arrest are shown in table 3. The median age of patients with OHCA was lower in Seoul (65 years) than in Osaka (75 years) in 2006, and increased to 69 (in Seoul) and 77 years (in Osaka) in 2010. The proportion of OHCAs that occurred in public places increased in Seoul (12.5–20.1%, p for trend <0.01), whereas it decreased in Osaka (13.5–10.5%, p for trend <0.01). In both communities, bystander CPR rates increased significantly from 2006 to 2011 (from 0.1% to 13.1% in Seoul and from 33.3% to 41.7% in Osaka). Bystander defibrillation using PAD was performed in 0.4 to 1.3% of cases annually in Osaka, while only one case was observed in Seoul due to initiation of the PAD programme later in 2011. The proportion of OHCAs defibrillated by an EMS provider was only 0.4% in 2006 but increased to 17.5% in 2011 in Seoul, whereas the proportion in Osaka was 17.7% in 2006 followed by a slight decrease to 13.7% in 2011. Age-standardised and gender-standardised OHCA incidence rates per 100 000 person-years increased in both communities during the study period from 15.4 to 37.0 in Seoul, and from 30.6 to 39.1 in Osaka. Age-and gender-standardised OHCA survival rates per 100,000 person-years also increased in both communities from 1.0 to 3.1 in Seoul and from 2.4 to 3.5 in Osaka. Figure 2 shows temporal trends in survival and neurological outcomes in the two communities. During the study period, the overall neurologically favourable survival in resuscitation-attempted OHCAs with cardiac aetiology was 2.6% in Seoul and 4.6% in Osaka (p<0.01); and the proportions in witnessed cardiac arrests were higher at 4.0% in Seoul and 9.5% in Osaka (p<0.01). From 2006 to 2011, the neurologically favourable survival in OHCAs with cardiac aetiology increased significantly from 1.4% to 4.0% in Seoul (p for trend <0.01), whereas no significant temporal improvement was observed in Osaka (3.6% in 2006 and 4.8% in 2011; p for trend=0.30). Rates of survival to discharge increased significantly in Seoul from 6.8% in 2006 to 10.3% in 2011 (p for trend <0.01), while no significant increase was observed in Osaka (7.2% in 2006 and 7.8% in 2011; p for trend=0.90) (figure 2A). 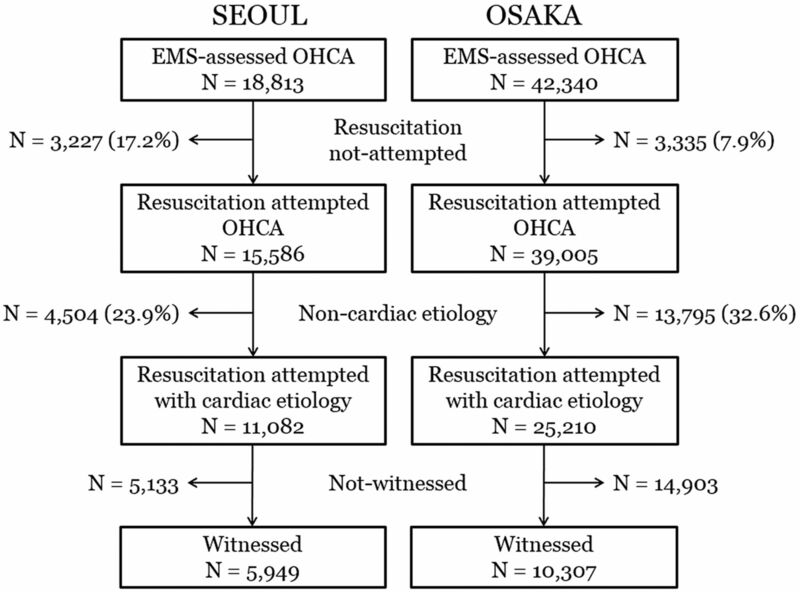 In the subpopulation of witnessed resuscitation-attempted OHCAs, similar regional trends were observed as in all OHCAs with cardiac aetiology; in Seoul, both survival and neurological outcomes were significantly enhanced, while no significant increase was observed in Osaka (figure 2B). Temporal trends of survival outcomes by community for resuscitation attempted out-of-hospital cardiac arrest with cardiac aetiology (A) and witnessed cardiac arrests (B) during the study period. Table 4 shows risk-adjusted temporal trends in survival outcomes in the two communities. Age-adjusted and gender-adjusted rates of neurologically favourable survival in resuscitation-attempted OHCAs with cardiac aetiology increased significantly in Seoul from 1.4% in 2006 to 4.3% in 2011 (adjusted RR per year, 1.17; 95% CI 1.09 to 1.26; p for trend <0.01), while no significant improvements were observed in Osaka (from 3.6% in 2006 to 5.1% in 2011; adjusted RR per year, 1.03; 95% CI 1.00 to 1.07; p for trend=0.08). In witnessed cardiac arrests, age-adjusted and gender-adjusted rates of neurologically favourable survival increased significantly from 1.9% to 6.9% in Seoul (adjusted RR per year, 1.21; 95% CI 1.11 to 1.32; p for trend <0.01), whereas no significant change was observed in Osaka (adjusted RR per year, 1.03; 95% CI 0.99 to 1.07; p for trend=0.13). This study demonstrated the differences in temporal trends in survival outcomes between two Asian communities and their associated factors for improving survival after OHCA using data from two large population-based registries of OHCA. Neurologically favourable survival in Seoul was significantly increased over the study period, but still marked relatively low rates. On the other hand, while showing an insignificant and steady change over the years, the overall survival rates remained relatively high in Osaka. We found difficulty in improving survival after OHCA in communities with already existing and developed EMS systems in places, such as Osaka, compared with communities with a developing EMS system, such as Seoul. Between 2006 and 2011, there have been substantial improvements at the community level and in the EMS system to increase survival outcomes of OHCA in Seoul. Bystander CPR education and advertising campaign were diffused quickly, 18 and the proportion of bystander CPR increased rapidly (about 13%) within the 6-year period of this study. Bystander CPR can double the chance of survival from an OHCA event in previous studies.25 ,26 For EMS providers, education programmes and quality control protocols were developed. In line with these efforts, initial ECG check and application of AEDs by EMS providers improved from 5% in 2006 to 45% in 2011 (data not shown), thereby leading to an increase in the proportion of initial shockable ECG from 0.1% in 2006 to 11.0% in 2011 and defibrillation by EMS from 0.4% in 2006 to 17.7% in 2011. Initial rhythms of ventricular fibrillation have previously been associated with enhanced survival outcomes.2 ,27 In Seoul, median time intervals from call to initial CPR and initial defibrillation were 5 and 11 min, respectively, in 2011, which were similar to those observed in Osaka. Although the resuscitation time course before 2011 was not applicable in Seoul, we assume that it would have been shortened during the study period. In accordance with these improvements in the chain of survival, the survival outcomes of OHCAs in Seoul were significantly improved throughout the study period (table 4). However, in Osaka, neurologically favourable survival did not increase during the study period. Numerous efforts to improve EMS factors, such as bystander CPR and prehospital defibrillation by EMS personnel, had already been implemented in the early 2000s in Osaka. Accordingly, a previous study reported significant improvements in bystander CPR, decreased time intervals from collapse to first CPR and first defibrillation, and improvements in survival outcomes during 1998 and 2006 in Osaka.5 In addition, OHCA incidence in public places and bystander-witnessed rates were decreased, which may have been characterised by the ageing society of Osaka. Despite continuous efforts in improving EMS factors and maintaining a relatively good EMS system in place, the observed plateau in the survival rates of Osaka may have accounted for a limit of obtainable benefits from the current EMS basic-to-intermediate level. As the quality of CPR is crucial to improve survival after OHCA, an effective and efficient CPR education programme and EMS quality control protocol, including a real-time feedback programme, should be considered.32 ,33 Modification of the EMS protocol to improve the quality of CPR on ambulance during transport should also be given consideration. This study has some limitations. Since this study was performed in two different metropolitan communities with basic-to-intermediate EMS service levels, we cannot generalise the results to communities with different EMS systems. Second, the outcomes in the two communities were measured at different times (at discharge in Seoul, and at 1 month in Osaka). Furthermore, information on hospital-based postresuscitation care of OHCA was not available, which may serve as an important factor in survival outcomes. Finally, while we tried to classify the patients using standardised definitions based on international guidelines,21 possible misclassification may have occurred, including the definition of cardiac aetiology, which can vary depending on the rigour of the efforts to identify other causes. In two large metropolitan communities in Asia, the temporal trends in survival outcome and associated factors for improving survival after OHCA were different. 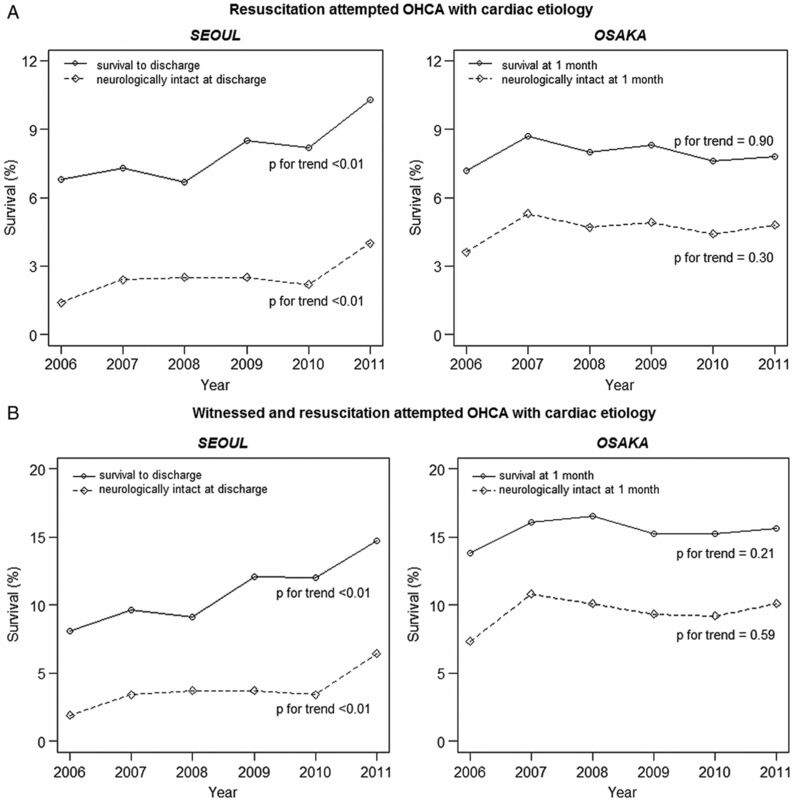 In response to an enhancement in the chain of survival, the survival outcomes after OHCA were significantly increased in Seoul, while these remained steady in Osaka despite ongoing regional efforts to improve community and EMS factors.
. Out-of-hospital cardiac arrest surveillance—Cardiac Arrest Registry to Enhance Survival (CARES), United States, October 1, 2005–December 31, 2010. MMWR Surveill Summ 2011;60:1–19. Contributors YSR analysed the data and wrote the paper; SDS and TI designed, analysed and interpreted the data and revised the paper; TK, KJS, EJL and KK analysed and interpreted the data and revised the paper; and SYK, CN, TS, TN and YH analysed the data and revised the paper. Funding This study was supported by the Japan Pfizer Health Research Foundation and the Korea Centers for Disease Control and Prevention. Ethics approval The study was approved by the institutional review boards of the Seoul National University and Osaka University. Data sharing statement YSR, SDS, TK, and TI had full access to all of the data in the study and takes responsibility for the integrity of the data and the accuracy of the data analysis.